Updates - God's Feeding Hands "Mission Center"
Larry and﻿ I have decided to purchase the building with our own funds, and run "God's Feeding Hands Mission Center" out of it. This decision is one that makes the most sense, and keeps everyone honest! We are stepping out in faith with this decision, but we know that our God will provide everything that we need in order to meet our financial needs! When God starts something, He always finishes it. 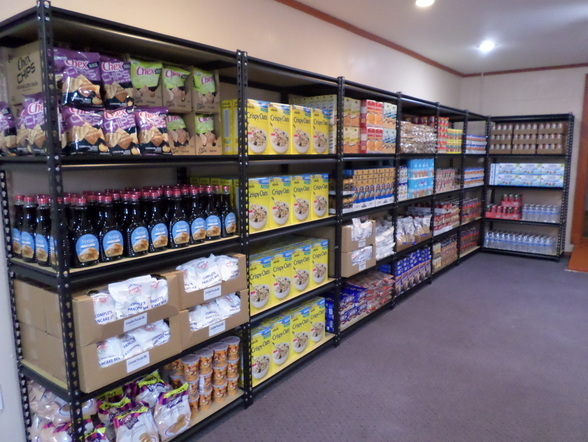 We still need your help with funds in order to update the current building, install shelves for the food, purchase food from our local food bank, and other things that our mission center needs! Your tax deductible gifts are much needed, and they mean so much to us. Thank you for believing in this ministry, and wanting to be part of it. May we join hands together and take care of God's children! We still are on track to close on June 8, 2015. We cannot wait until then, and wishes it was tomorrow! A lot of things are happening, donations are coming in, getting estimates for the updates for the building, measuring and remeasuring the building, and taking care of problems that jump up every once in awhile! Didn't realize all we had and have to do in order to get things ready for June 8. Please keep "God's Feeding Hands Mission Center" in your prayers. God is with us, so who can be against us! Just received word that our closing date has been moved up to May 27, 2015! We are just praising God that we can close earlier and start remodeling sooner that we expected! God is soooooooo good. He knows that we are eager to start His ministry and cannot wait to get going with all that we have to do. Donations are still coming in thanks to God and all those who truly believe in this ministry. Wal-mart is going to donate some funds in order for us to purchase shelving for us to put the groceries on. They even said that they will provide $100.00 a month, if available, so we can purchase items for the food pantry! We truly cannot believe how faithful each one has been in giving towards this ministry! It touches are heart when we think about it. God continues to lead the way, and we are so thankful that He is in charge of everything! Please continue to pray for this ministry, and pray that God will help us to make all the right decisions concerning His ministry! Working for God is exciting! It has it challenges, and the responsibilities are tremendous! We just want to do everything that we can do in order to honor and glorify His wonderful name! May our God be praised forever!!! It is official, God's Feeding Hands Mission Center is ours! Praise the Lord! We took ownership on Tuesday evening the 19th of May, and have been busy ever since. We have been cleaning, scrubbing, painting, getting estimates for the remodel, trying to figure out where everything is going to go, thanking God for such a wonderful site to house God's Feeding Hands Mission Center, redecorating, and the list goes on! We received our first grocery donation from our dear sister in faith, Christine, and it really touched our hearts greatly! God is just sooooooooooo good! Our God is beyond words!!! We are thankful for all the prayers that have been sent up on our behalf, and for God's Feeding Hands Mission Center! We have a lot to do in the next few weeks, so please keep praying for us and the center! We want to do God's will, and we surely cannot do it without His help and strength! We have been looking and praying for a contractor to start remodeling the center, and God delivered! We will sign a contract with him on Friday, and then he will start in about two weeks. We are really getting excited about everything! God is making things happen, and He is in total control of everything! It is so wonderful to watch God work. It is truly amazing how He does things. He is so precise, so in control, so helpful, and He knows what we need, even before we can even think about it. He is always one step ahead of us! We serve a God who we trust, believe in, and LOVE! We are totally depending on God to finish what He has started, and we know that He will come through! We kindly ask that you remember God's Feeding Hands Mission Center when you go to God in prayer! Prayer is powerful! To God be the Glory forever and ever! Its been three weeks since we closed on God's Feeding Hands Mission Center, and we have done so much, thanks to God! We have almost completed painting the outside of the building, and inside. The new paint job really looks awesome! People on the street think that it looks great and beautiful! It is a big change from the old one! It really stands out in the neighbor hood! It is the brightest one by far! God really likes colorful things! Should start renovations next week if all goes as plan. A lot of people are stopping by to see when we are going to open. Seems like they just cannot wait until we open the doors. Praise God! We past our inspection from the Food Bank out of Ft Smith, AR. We should be in the system in two weeks, and then we can start ordering groceries for our pantry! Things are getting done, and they are getting done on God's time. What a God we serve! Keep us in your prayers, and pray for the construction work! We can hardly wait until everything is done! May our God be praised and glorified forever! Construction on God's Feeding Hands Mission Center is almost complete. It has taken a long time for everything to be completed, but by God's grace it will be completed on September 9, 2015, except for a few minor things that are on back order. It really looks great. Will post some pictures when everything is done so that all can take a look at the finished project. We have a lot of cleaning up to do, and will have to repaint some walls, plus paint the new walls that have been added. We just cannot wait to get started with everything! Please continue to pray for God's Feeding Hands Mission Center. We cannot believe that we will be able to move back in a few days and get started doing our Fathers Business. May His will be done, and may He be glorified and honored in all that we do! Grand opening date is set for October 26, 2015! It has been a long hard road, but thanks to God all has come together! We just praise our Father for all that He has done for us! We could not have done this without His help and support! Our Father is sooooooooo wonderful and takes care of His children in such a special way! We just pray that we will be obedient to His call, and that all we do will be acceptable to Him. It is all about Him and not about us! Thank you for all of your prayers and donations. This has been a joint effort, and we want everyone to know that you all are a part of God's Feeding Hands Mission Center! May we all rejoice and be happy, because look what the Lord has done! Pastor Brandon Westgate will be dedicating God's Feeding Hands Mission Center on Monday the 19th of October. What an exciting time it will be. God's ministry is only days away from becoming a reality! When God starts something is always finishes it. Just wanted to say thank you to all who played a big part with His ministry, through donations, hard work, and support! We don't know what to expect, but God is in control, so I know that it will something to behold! We serve a wonderful, and great God! To Him belongs all praise, honor, and glory!!! Opening day (October 26, 2015) has come and gone, and by God's grace we were able to serve 267 people and gave out 12 Bible studies. Everyone was so thankful for the ministry, and for all the groceries that they received. Their faces said everything! What an awesome God we serve! We prayed that God would send those that were really in need, and did He come through! I wished everyone could have been there to see what we saw and felt, because it touched us all so much. What a difference it made to those who came! They really enjoyed getting to pick out their own items, instead of having them prepacked by us. God came through for all these people in a big way. May we all give praise and glory to our Most High God, because it was Him that made this possible! Our second day (November 9, 2015) of operation was unbelievable. It was very cold, but God stepped up and served 367 people, and He gave out 55 Bible studies, plus DVD's, books, and CD's! God sent us three new volunteers to replace the five we lost, and we never missed a beat. The new volunteers were totally blown away and truly loved what they did for God! We just cannot quit praising our God for all the help He provided to us today. Most of the people that came today were new folks that did not come on opening day. A lot of them were young people, with little babies, and empty stomachs! Most did not have a job or food to eat. They came with sad faces, but left praising God and smiles on their faces. They did not have to say a word, because there faces said everything! The activity at the resource center was unreal. They just could not stop taking the material that was available to them, and even asked for Bibles. What a successful day for God! If anyone has a Bible that they would like to donate to God's Feeding Hands Mission Center or other literature please send them to us, because we sure could use them. God is working on the hearts of the people here in Mena! We had a blessed and a terrific day working for God and His ministry today. May we all give God the praise that He deserves. It has been 10 months since we opened the doors with God's Feeding Hands Mission Center and by the grace of God we are doing fantastic! God is providing all of our needs, both with volunteers and donations! God is in total control of His ministry! It is just hard not to love a God that is always there when you need Him! We give Him all the glory and honor, and praise Him for all that He has, is, and will do for us! We served over 500 people in the month of August and gave out numerous Bible Studies, DVD's, CD's and Bibles. We just cannot keep the Bibles on the shelves. They go out just as fast as they come in. We sure could use some if anyone has some that they do not need, or if some Church has some laying around that they do not need. Some have actually cried when we gave them a Bible. What a way to share Jesus! What a honor and privilege it is to be working for an awesome God! God is touching the hearts of those who come through His doors in His ministry. We are blessed to be a part of His ministry and thank Him daily for allowing us to help minister to His children. So many people are being touched, blessed, and changed by what is happening through His ministry. May His Grace continue to shine upon us; and all that come to God's Feeding Hands Mission Center. To God be the Glory! Food Pantry area is set up! Bible Studies and Recovery DVD's! Parking lot with new gravel! What a great God we serve! He provides all of our needs! Serving the needy! What a blessing!